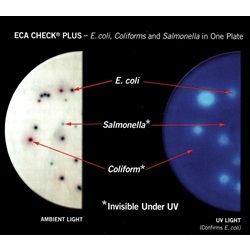 E. coli colonies will appear as a dark blue color and may have a slightcolored halo. 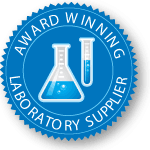 With the ECA Check® Plus media, they will fluoresce a bright blue under long wave UV lights when viewed in the dark. Other Coliforms will appear as lighter blue-gray colored coloniesgenerally, but may show variation toward purplish/pink depending upon the relative amounts of the various enzymes they produce. 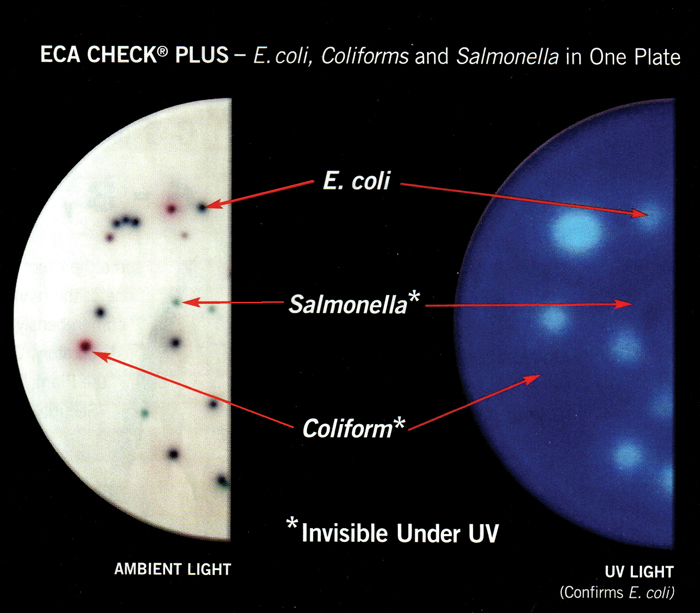 Salmonella spp. grow as light green colonies which darken with age. (They are indole negative). Aeromonas spp. grow as pink (sometimes very light pink) colonies. (They are oxidase positive).